Recycling at the Market is good for the environment and can save you money. minimise the cost of operating the Market – and therefore the cost to Market tenants, increasing cost effectiveness and competitiveness. IKON Services Australia manages recycling, waste collection and cleaning within the Market on behalf of the Melbourne Market Authority (MMA). A user-pays system is now in place, making recycling and waste management fairer for everyone. Sorted recyclables including cardboard, paper, polystyrene and plastic are recycled free of charge. The first 40 kilograms of uncontaminated/clean organic waste can be recycled free of charge with every additional kilogram charged at a rate of $0.075 (ex GST) per kilogram. $0.19 (ex GST) per kilogram for general waste and contaminated organic waste for landfill. Unsorted waste delivered to the Recycling Transfer Centre will be charged at the general waste/landfill disposal rate. Plain pallet disposal is free at the Recycling Transfer Centre and dedicated plain pallet drop off zones. Any waste dumped on Market land will be tracked to a market user. Dumped waste will be charged at general waste rates and will incur demerit points under the Market Operating Rules. Associated cleaning charges will also be charged at $200 per incident of dumping. Separate at the point of origin and take your recycling to the Satellite Recycling Stations or Recycling Transfer Centre to avoid waste disposal fees. 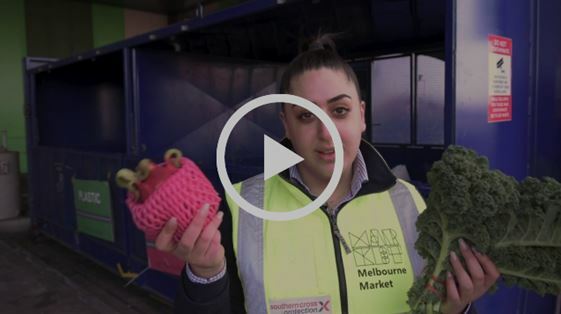 Watch the below video to hear Merna answer some of the more trickier questions when it comes to disposing of waste at the satellite recycling stations. All bulk waste and recyclables must be delivered to the Recycling Transfer Centre. For small quantities, there are 8 Satellite Recycling Stations located around the Market. Each Satellite Station contains Maxicages where you dispose of your separated recycling. Each Maxicage displays the signs for each recyclable stream. Small quantities of organic waste (1-2 boxes) can be disposed of in designated tote bins located inside the Fruit and Vegetable Trading Stands from 6.00am to 9.00am Monday to Friday. 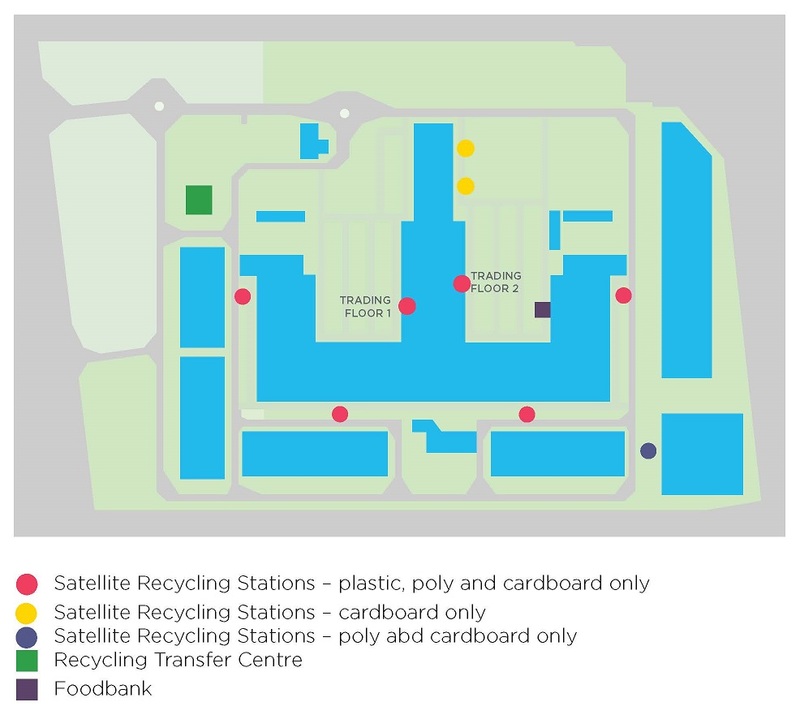 The Satellite Recycling Stations adjacent to the fruit and vegetable Stores will accept cardboard, polystyrene and plastic only. Organics are to be disposed of directly at the Recycling Transfer Station. Payments must be paid at the Recycling Transfer Centre (cash, debit card and credit card including paywave accepted). All credit card transactions attract a 2.5% transaction fee. The IKON manager at the Recycling Transfer Centre will work with you to provide the most cost effective disposal, including rates for bulk organic disposals. All payments are issued a receipt. There is no need to lock into a contract, you can pay as you go. If you deliver your waste to the Recycling Transfer Centre, you save on pick-up fees. Tote bins can be used to dispose of bulk waste or recyclables, just remember to separate to save. The tote bins will be digitally tracked through a radio frequency identification system. To reduce your costs, tote bins can be picked up and dropped off to the Recycling Transfer Centre at no cost. Alternatively you can have a tote bin picked up or delivered for $23.00 per pick up/delivery. There is no weight limit on waste disposal at the Recycling Transfer Centre. All organic and general waste is charged at a set price per kilogram “overweight charges” do not apply ensuring there are no unanticipated costs when disposing of your waste. Traders at the Melbourne Market have a long history of donating to Foodbank. Organic product that is fit for human consumption can continue to be donated to Foodbank next to Store 148 Monday to Friday from 6.30 am until 9.00 am and is tax deductible at the Market price of the produce. Contact Foodbank on 03 9362 8300. Any pallets left anywhere on Market Land will be cleared and disposed of by the MMA at a cost of $150 (ex GST) to the responsible Market Business. If the pallet disposal includes other waste such as boxes of produce, the cost is $200 (ex GST). Plain pallets can be disposed of at the Recycle Transfer Centre at no charge or left at one of the designated pallet drop off zones around the Market. All Market users of pallets should have an account with Loscam or CHEP for their pallets. Collected by three local farms using produce for livestock feed. Distributed via Foodbank networks and agencies to feed Victoria’s vulnerable communities. Packaging, industrial paper, tissues, newspaper, insulation’s, kitty litter or even moulded cartons for eggs and fruit. Used to make 100% recycled PET. Used for fleeces, sleeping bags, pens, carpet, and plastic tables and chairs. Mulched for use in gardens, playgrounds, schools etc. *Annual volumes as at 18 Jan 2018. For other recycling and waste queries please contact the Melbourne Market Services Manager on 0428 910 182 or speak with a Market Relations Officer.